The possible use of vanadium compounds in the treatment of diabetic patients is now being evaluated. However, previously to establish the optimal maximum dose for diabetes therapy, it should be taken into account that vanadium is a highly toxic element to man and animals. The toxic effects of vanadium are here reviewed. The tissue vanadium accumulation, which would mean an additional risk of toxicity following prolonged vanadium administration is also discussed. 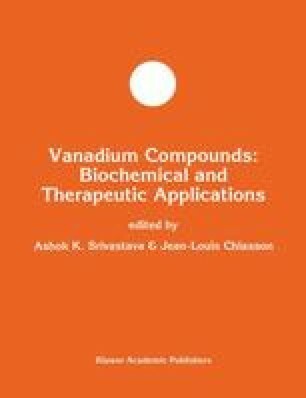 Recently, it has been shown that coadministration of vanadate and TIRON, an effective chelator in the treatment of vanadium intoxication, reduced the tissue accumulation of this element, decreasing the possibility of toxic side effects derived from chronic vanadium administration without diminishing the hypoglycemic effect of vanadium. However, previously to assess the effectiveness of this treatment in diabetic patients, a critical reevaluation of the antidiabetic action of vanadium and its potential toxicity is clearly needed.